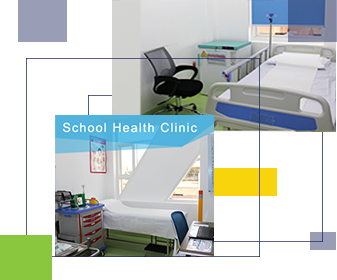 Our clinic provides primary and preventive healthcare to pupils across the school. Our clinic is fully licensed by the Dubai Health Authority. The clinic includes a treatment room and two observation rooms and is fully equipped for primary first aid and health care. The clinic is staffed by a full-time nurse and doctor. We make every effort to promote hand-washing and good hygiene in the school to prevent the spread of illnesses. Our nurse undertakes routine check-ups on hair, nails and personal hygiene as well as taught lessons on basic personal health-care.